Pillows! They are such a personal bedding item, and there are a number of different fills to choose from. One of our best selling pillows is the Wooly Bolas Pillow by Suite Sleep. The zippered casing is made from organic cotton in a sateen finish, and it’s filled with round little bits of Eco Wool called “bolas”. 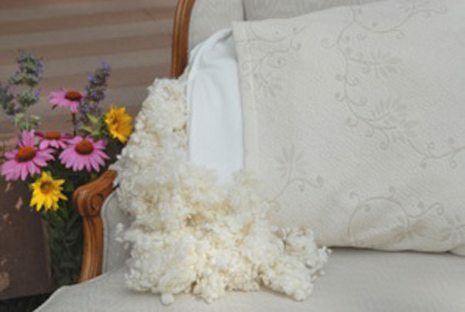 One of the attributes that makes the Wooly Bolas Pillow so great is its versatility. We love the ability to customize when it comes to the products we offer and the wooly bolas pillow is one of our favorites. I like that I can unzip the casing and pull out some of the “bolas” if it’s too full (which I have done), and if it gets a little flat after sleeping on it for a few months, I can add more bolas to fluff it up! Since the loft of the pillow can be adjusted so easily, the Wooly Bolas pillow is a good fit for most types of sleepers—whether you sleep on your back, side or stomach. Another great feature is the optional knit envelope encasement. It’s made from flexible organic cotton knit fabric. This additional cover makes the pillow feel a little plusher and can help smooth out the surface. We at The Natural Sleep Store are such big fans of Suite Sleep and the products they offer, and they really hit the mark with the Wooly Bolas Pillow. Interested in learning more about Suite Sleep and their great products? Read Sam’s blog on her interview with Angela, the owner of Suite Sleep. The Natural Sleep Store is happy to feature the Suite Sleep Wooly Bolas Pillow (giveaway is for the standard size pillow, worth $134) as our Fall giveaway! ENTER to win! No purchase necessary. Giveaway ends October 31st, 2014. Congrats to Tom D. of Fort Collins CO, you won this giveaway!